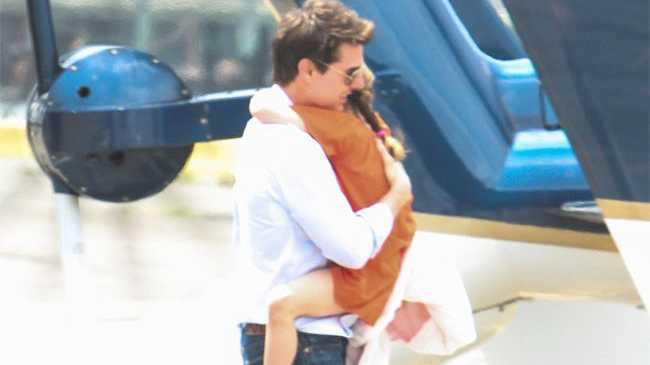 TOM Cruise relies on daily phone calls to keep in touch with his daughter Suri. The 50-year-old actor was granted generous visitation rights to his six-year-old child when he split from her mother Katie Holmes, who received full custody, and as he is currently shooting 'All You Need is Kill' in London while Suri attends school in New York, Tom calls her up to twice a day to check in. His attorney Bert Fields told E! News: "Tom has been in England shooting a film. He calls Suri every day, sometimes twice a day. "He loves Suri and is a constant presence in her life. As in the past, when he's shooting in a foreign country, he has to rely on daily phone calls." Tom has also ensured Suri is financially secure and has set up a trust fund for the youngster, although she will be unable to fully legally claim the money until she's in her 30s. A source said: "Katie wanted the trust fund put in place for Suri so that their daughter will be able to tap into after she turns 18 years old. "Katie has absolutely no access to the money and didn't want to. She just wanted to ensure that Suri would have financial security as she becomes an adult. It's a sizable trust fund, but Suri won't be able to fully legally claim it until she is in her 30s. "Tom had no problem with the request and planned on doing it for Suri anyway."